Meet Max! 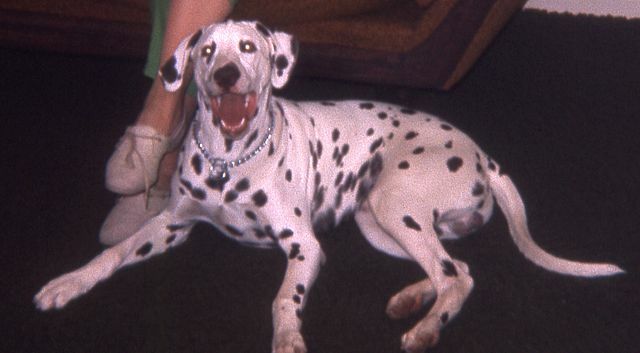 He was one of our family dogs when I was growing up. Max was a master of destruction both inside the house and outside in the backyard. He was an expert on landscaping, or maybe I should say re-landscaping from the way he liked to tear out rose bushes from the roots and destroy them, thorns and all! Max had his own ideas on what a dog-friendly yard should look like and while he’s going to share his thoughts with you below, I’ll be throwing in my two cents too! Max on Fencing: Remove any barriers that could prevent me from running wild through the neighborhood, day or night! My Advice: Make sure your yard has proper fencing to prevent your pup from escaping. A fence should be high enough to keep those athletic high jumpers from making it across and secure at the bottom for dogs that like to dig. Buried chicken wire or rocks placed along the bottom of the fence line will help deter the tunneling escape artists. Since us humans have a habit of forgetting to close or properly latch gates, installing a self-closing gate will save you a lot of headaches. Check your fence occasionally for holes or needed repairs. Max on Plants: I have no preference here, I love them all! Give me a variety of flowers, plants and shrubs that I can pee on, chew on and tear up by the roots! My Advice: There are a LOT of plants, flowers and trees that are toxic to dogs. In fact, there are so many, I didn’t have the space to mention all of them here. Instead, I’ll send you over to the ASPCA’s website where they keep a huge list of plants that are toxic and non-toxic to dogs and cats or check out this list by ProFlowers. The ingestion of toxic plants can cause symptoms ranging from mild gastrointestinal issues (vomiting and diarrhea) to severe symptoms such as lethargy or even death. Take a few minutes to survey your yard for toxic plants and do some research before buying any new plants or trees to make sure they’re safe. Wire cages can be placed around existing plants to keep your dog away and help prevent chewing of the plants. Max on Mulch: Cocoa Bean Mulch sure smells good to me! My Advice: The one mulch I would avoid having in my yard is cocoa bean mulch. Although there’s some debate about how toxic this mulch is, why take any chances with your dog. Cocoa mulch contains theobromine which is the ingredient found in chocolate (especially dark chocolate) that is harmful to dogs. Max is right, it smells great which means some dogs may be inclined to eat it. The size of the dog, the amount eaten and the amount of theobromine contained in the mulch are all variables which make it hard to predict what kind of reaction might occur if the mulch is ingested, but symptoms of poisoning include vomiting, diarrhea, rapid heart rate, muscle spasms, seizures and possibly death. Again, with so many choices available, why take a chance on cocoa bean mulch. Sorry, Max! Max on Pests: There’s not much I can do about them, except scratch and then scratch some more. Oh, and bring them into the house with me! My Advice: Even dogs like Max, that can quickly destroy a newly planted rose bush, deserve to be pest and parasite free. Start with natural methods of preventing pests in the yard like keeping the lawn mowed and vegetation trimmed. Consider planting some lavender, rosemary or mint to naturally deter fleas. Get rid of any sources of standing water to keep the mosquito population under control. Clean up clutter, wood piles and leaf piles which can attract snakes and spiders. Secure garbage cans to avoid attracting rodents or other wildlife to your yard that may carry diseases like Leptospirosis. When selecting lawn pesticides, consider natural options such as nematodes or diatomaceous earth before toxic chemicals. If you use chemical pesticides, be sure to read the directions carefully and keep your dog off the lawn until it’s safe to return. See your vet for recommended oral or topical parasite control methods for your dog. Max on Lush Lawns: Heck, I couldn’t care less how green the grass is, I’m too busy wearing a path around the perimeter of the yard and digging holes! My Advice: Yeah, a perfectly manicured lawn and a dog do not go hand in hand, but that doesn’t mean your yard has to look like a neglected, dusty lot. Begin designing your dog-friendly landscape plan by thinking about your dog’s needs. First, avoid chemical fertilizers if possible. I know, that’s hard to do sometimes, but always look at organic or natural options first and keep your dog away from recently applied chemical fertilizers. Instead of continuously patching and reseeding that path your dog has worn in the yard, consider turning it into a paved walking path by installing some attractive paving blocks or stones. Is your dog digging holes in the yard? Create a digging station just for that purpose and teach him to only dig in that one spot by burying some toys or treats there. Burned urine spots on the grass are another issue, especially if you have a female dog. If the spots really bother you, think about making a potty station and use treats to train her to go in that one spot or plant tall fescue grass which is more tolerant of urine burns. Small decorative fences or border plantings of urine resistant plants (violas, columbine, lilac and ornamental grasses) are a good way to prevent urine damage from male dogs. Spraying plants with cayenne pepper spray is also an effective way of keeping dogs away from plants. Max on Comfort: After I’m done wreaking havoc in the yard, I could sure use some fresh, cool water and a nice place to rest before doing it all over again. My Advice: Absolutely, Max! All pups need shade and lots of fresh water while spending time in the yard. Dehydration and heatstroke are serious risks for dogs when it’s warm outside. Make sure there’s at least one shady area in your yard where your dog can relax and cool off and always have plenty of fresh, clean water available for him to drink. Auto-refilling water fountains make it easy to keep the fresh water flowing and installing a doggie door gives your dog the option of coming inside if he’s had enough of the great outdoors. Max on Poop: Not a big deal, it seems to bother my owners more than me, especially when I track it in the house and onto the carpet. My Advice: Some dogs are careless about where they step and others have been known to even eat poop on occasion, but we’ll save that discussion for another day. Yep, you’ll want to scoop the poop every day to avoid these unpleasantries. Max on Recreational Activities: I only have one and I’m darn good at it! Destruction of all things in the yard. My Advice: You don’t want your pup to follow Max’s advice on this one, so give him something to do while in the yard. What dogs love most is quality time with their best friends, that’s you! Play fetch, chase or their favorite game of choice. Provide some toys or safe bones for your dog or maybe build a small agility course. If you’re lucky enough to have a swimming pool, teach your dog to swim. Be sure there are steps or an easy way for him to get out of the pool. Completely block the pool from dogs that can’t swim. Destructive behavior can often be eliminated by burning off excess energy through exercise but time in the yard shouldn’t be your pup’s only form of exercise. I loved Max, despite his destructive nature. Some of my favorite memories of him include being dragged on my belly across the yard when trying to take him for a walk or when I accidentally spilled my plate of spaghetti on his back. But hey, he got a huge helping of one of his favorite meals out of that fiasco! There are plenty of good Max stories, but my favorite is what he did one night when he was left home alone. He selectively picked several books from a stack that were borrowed from our local library and perused them in his own special way. That’s right, he chewed only the books from the stack that were about dog training! Those books are probably long gone, but I’m sure a few people read them and chuckled after Max got his paws on them. There were no dog-eared pages, just a lot of teeth marks on the covers. I wish I had more pictures of Max to share with you, but here’s a short video clip of him when he was behaving like a gentleman. Having a dog doesn’t mean you can’t have a nice lawn and yard. It just takes a little planning and a little training to create the perfect dog-friendly yard. How did you make your yard safer or more dog-friendly? Share your tips, hacks or problem solving strategies with us. This was fun, great post! Thanks Jenna, it was fun to put the post together and remember all the crazy antics about Max. What a creative way to share valuable content. Really enjoyed reading all of it. Will have to look at that link regarding the list of plants. Doodle Dad will start working in the yard soon. Yes, the link is really convenient since it has all the toxic and non-toxic plants listed in one place. Luckily, Haley is not a plant chewer because I discovered we have a few toxic plants in our yard. What a great post. Happy Mischief Monday! This was a clever way to present some great information about creating a dog friendly yard, Elaine. The conversation with Max and his ideas on a dog friendly yard made it fun to read. It was fun imagining what Max would have thought about each topic. Perhaps we should have called him “Mad Max”, haha! I’m glad you enjoyed the article, Rachele. I’m glad Max wasn’t the only dog protesting a little training, haha! I’ve always wondered if maybe he smelled the scent of other dogs on the books. As amazing as our dog’s noses are, I guess it’s possible. I love to chew up the rose bushes and raspberry bushes…pretty much all the things with thorns! Max and I would’ve been great partners in crime! We are currently yard-less but I’ll have to keep it in mind for the future. I had read most of the suggestions before but not the one about mulch. 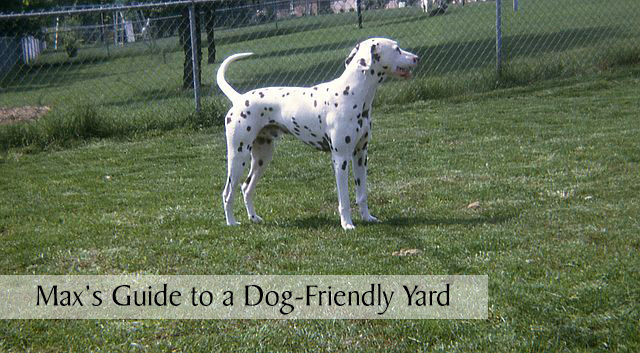 Great ideas for a dog friendly yard. We allow our dogs to dig — in certain spots — so they have fun and we can too. And I totally agree with the concept of paying close attention to what we put on our lawn. No chemicals! Thanks Susan, I’m really intrigued to learn more about nematodes and diatomaceous earth. I just discovered the other day that diatomaceous earth can also be a supplement for dogs. Interesting stuff! I have heard of cocoa mulch and its potentially toxic effects on dogs, so I would definitely not take any chances with using it. We have two hard plastic kid pools for the pups, and we make sure to always empty them after having used them in order to not create an impromptu mosquito breeding station..
Thankfully our pups are not big on digging, so our 6 ft fence works great. We don’t have a self-closing gate, although I love the sound of that!, but we do keep a lock on it at all times (the gate at our old house was blown open once by a very strong wind gust, so that needs to be avoided at all cost!). I especially like the fact that you pointed out that all dogs need daily exercise outside of the boundaries of their yard! Sure, a fenced-in yard is wonderful to stretch those K9 legs, but it does not replace the daily walk. How boring it would be to see and SMELL the same smells over and over again on a daily basis. Dogs contained to nothing but the yard can definitely develop problem behaviors such as digging & excess barking. Thank you so much, Barbara! I’m glad you liked the post. The plastic pools are really nice to have during the hot summer, aren’t they? I really wish we had an in-ground pool since swimming is great exercise for dogs that like the water, but we may have to get another plastic pool this year for Haley. Great post! Max has a lot of good ideas! 🙂 We mostly have hardscape and potted plants in our backyard. Poor Rita would certainly prefer a lush lawn, but she’s stuck with us! Great post! (And Choppy is definitely of the Max persuasion when it comes to a dog-friendly yard). Really? I’m so surprised by that, Choppy seems much more refined than Max was. Maybe it’s all the A-Z outfits, lol! What a dreamboat! I love the Christmas stocking photo. He was so tiny in that photo! I wish I could go back in time and see Max through my adult eyes and play with him for a little while. LOL! Love the Max stories!!! Such a fun way to get good information out there too! Love it! Max was a handsome and talented guy! 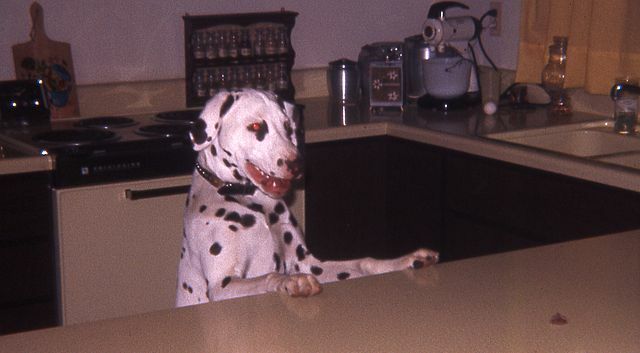 I’ve always thought Dalmatians were beautiful dogs. Great advice for yard care, we do a lot of those things. We gave up on a lush lawn inside the dog yard, but we have another area of the yard where we can have that (no chemicals for us, we’re strictly organic yard and garden care). I also moved all of my gardens out of the yard too when we got our golden retrievers….there was way too much digging up of my plants going on! Maybe your Goldens were onto something, digging up some fresh veggies for their healthy diets, haha! Max was quite a smart dog. I love all of his advice. He was a smart dog and full of energy, that’s for sure! We have our yard sprayed with a natural spray and I spray the dogs down every day during the heavy tick seasons. I love reading all about Delilah’s antics on your blog and it’s nice that Sampson brings some calm to balance things out a little bit. You could probably turn your fencing idea into a cool “Extended-a-Fence” product if you guys have another snowy winter next year, lol! I loved meeting Max. And this was a really cute way to talk about a safe yard. When we built our current fence, I had a dog who chased cats. So we planned a fence with lattice squares that were large enough to allow a cat to flee if Shadow found one in the yard. Unfortunately, those large lattice squares were big enough for various foster puppies to escape through. So we always had to be especially vigilant. I guess my advice would be to plan your yard for dogs at all sizes and life stages. Great advice, Pamela! That would save a lot of money and hassle in the future, especially if you plan on fostering dogs. Thanks for the useful tip! 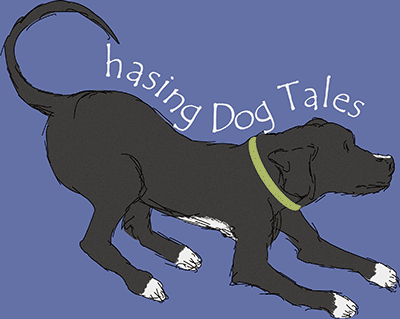 I love how you weaved Max’s story into these great tips, great writing & great post! 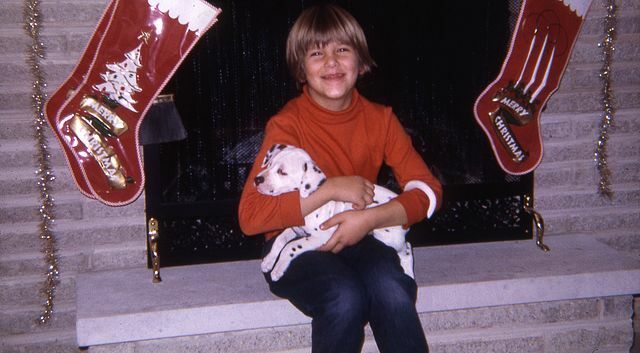 Max is so precious, what a beautiful puppy he was! Thanks for stopping by today! Yes, Max was an expert at dragging me and my brother and sister around through the grass and the snow, lol! What a fun and creative post! You make excellent suggestions, especially about the cocoa mulch. It really does smell amazing, but many people don’t realize the potential for toxicity. Thank you, Camille! I’m going to look for some cocoa mulch at the nursery just so I can check out how wonderful it smells.